Megawins is what every casino player is looking for, so this casino name makes a lot more sense than some of the other ones out there! 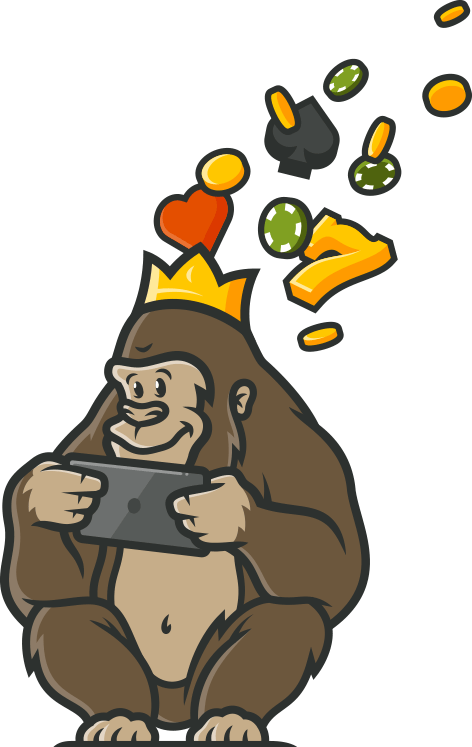 The Casino Gorilla has known his share of Megawins before, and as he wasn’t familiar with this particular site was excited to discover more about it. Megawins Casino claims to offer the highest standard of entertainment and put ‘a great emphasis on privacy’ which is a rather unusual phrasing, as most sites emphasise ‘security’. They offer Bitcoin as a funding method though, and as that is quite a private funding method perhaps that’s what they meant. The Casino Gorilla will be our guide to what else this aptly named casino has to offer. A growl which set nearby cups and saucers rattling indicates that the Casino Gorilla is unhappy about something. Turns out that the ‘something’ is the way that Megawins advertise their welcome bonus. They offer a ‘150% up to €200 +180 free spins’, which might very easily give you the wrong impression. In fact it is not one 150% bonus, but instead a 100% bonus on the first deposit with a further 50% offered on the second. That is certainly not as good a deal as a casual glance at the offer would suggest. Also buried in the small print is the fact that unless you wager through the bonus amount once within 24 hours of claiming it then you won’t get your free spins. 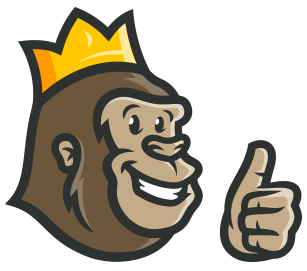 Be careful with this one: it’s a little bit tricky and the Casino Gorilla is not impressed! You can earn 180 free spins as part of your welcome package with Megawins Casino, over your first two deposits. The free spins are doled out in groups of 20 each day and you must use them each day as they disappear after 24 hours otherwise. The first 140 spins are for the Slotomon Go game with the second 40 available for Aztec Magic Deluxe. One very important factor to bear in mind is that if you haven’t played through your bonus at least once in the first 24 hours there will be no free spins for you. Both bonuses will be triggered automatically upon making your first two deposits without the need to enter a bonus code. Megawins will give you the option to opt out of receiving a bonus, which you can do by checking a box in the deposit section of your account. If you don’t want to have to complete wagering requirements before withdrawing your money then it is wise to check this box. Let’s be honest, if you are a super fan of live casino action then there are many casinos out there with better options than Megawins. At the Megawins live casino you will find a few live dealer tables offering blackjack and roulette and… well that’s it. Casino poker has become almost standard at many live casinos and you would expect to find at least one version of poker along with a live baccarat table. Minimal selection available here, unfortunately. The live dealer casino at Megawins may not impress, but there is no issue with the mobile gaming options. You can play a large range of games from your mobile device without any problems. Whether you have an Apple or Android device, or you favour tablets or smartphones, just enter the site in your browser and start playing instantly. Just make sure that you have a strong wifi connection and start playing for real money no matter where you are. One of the factors that allows Megawins Casino to stand out is the fact that Bitcoin is welcomed here – in fact the casino describes itself as a ‘Bitcoin casino’. There are plenty of other options though for people who prefer to use regular currency. That means you can choose debit and credit cards, e-wallets like Skrill and Neteller as well as Paysafecard and bank transfer options. The withdrawal limit is €4,000 per transaction and withdrawals will be processed within 3 working days. The Curacao licence is not one of the strongest but there have been no issues reported with Megawins Casino in terms of security or fairness. The bonus is somewhat tricksy, which is a problem, but the games on the site are checked independently to make sure they are fair. Also, the games come from recognised games providers which have to maintain the highest standards themselves to keep their European licences. Software encryption is used to keep transactions private and secure. If you have any questions then your first port of call should probably be to go to the well maintained Help section. Apart from that, you can get in contact with the support team via live chat, where they promise to respond to all queries within 5 minutes at the latest. Unfortunately there are no other contact methods, so your access to the support team is somewhat restricted in that sense. The Casino Gorilla was left scratching his head after reviewing this casino, and not because of all the tiny beasties which have made a home in his fur. The way the bonus is advertised is somewhat misleading, and that is never a good thing. However, there are lots of good games on the site and having so many providers contribute is always a plus. Something of a mixed bag here and not yet a casino of the highest rank. Don’t get too excited, you won’t win much here. Games are okay and they can be fun, but I haven’t won any large amounts while playing the slots. Not sure about video poker or blackjack. A very easy casino to start playing at. Navigation was super easy. The Amatic slot is my favorite and the casino accepts bitcoins too, so yay! I think this is one of the most progressive casinos out there. The game selection is also great!